Labour's chairman has defended the way the party raised £13.95m in undisclosed loans from wealthy backers to fight last year's general election. 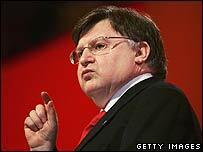 Ian McCartney said Labour acted within electoral law and used "every single penny" to get its MPs elected. It was made clear "significantly more" would be spent campaigning, he said. Labour says in future it will name lenders amid claims - vehemently denied by ministers - those lending money were being rewarded with peerages. Meanwhile, Conservative leader David Cameron is preparing to unveil his party's plans to revamp the funding system. In an interview with the Daily Telegraph, he said he was "unhappy with the whole way that politics is funded in Britain". Downing Street has appointed Sir Hayden Phillips, an ex-top civil servant described by No 10 as an "independent figure", to lead cross-party talks on the future of party funding. In a letter to MPs, Mr McCartney acknowledged that "a number of colleagues are unhappy about the issue". But he said the money raised meant the party could rebuild its political research capacity, providing them with more campaign support. "This was naturally an expensive process, a multi-million pound process and it was paid for by the party's fundraising activities," he added. "Bear in mind too that we fought the 2005 election in the face of a very heavily funded Conservative campaign - a large part of which was reportedly funded by loans, and targeted at individual Labour MPs." The figures released by Labour for 2005 mean the bulk of the £17.94m the party spent on its general election campaign was paid for by loans from individuals on the understanding their names would not be made public. The Conservatives have also pledged to name people who lend the party money in future and they have revealed that they already publish the amount they receive in loans in their annual accounts. The latest figure available is for 2004, when the party was lent £9,021,000 at commercial rates, plus £4,316,000 interest free from constituency associations. The figures for 2005 will be published in July. Ministers have been swift to point out there is nothing illegal about the practice - under current rules, political parties have to declare donations of more than £5,000 but loans can remain anonymous. A Labour spokesman said the loans were taken out at commercial rates and would be repaid. On Thursday, Tony Blair pledged to review the party funding system after it emerged even Labour's treasurer Jack Dromey had not been told about the loans - something the prime minister admitted was wrong. He admitted he had not told the Lords appointment committee three of his candidates for working peerages had given the party loans. He pledged changes to party funding, ministers' private interests and the honours system. 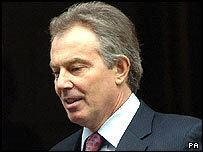 Mr Blair also said that he wanted to renounce the right personally to nominate people for honours.